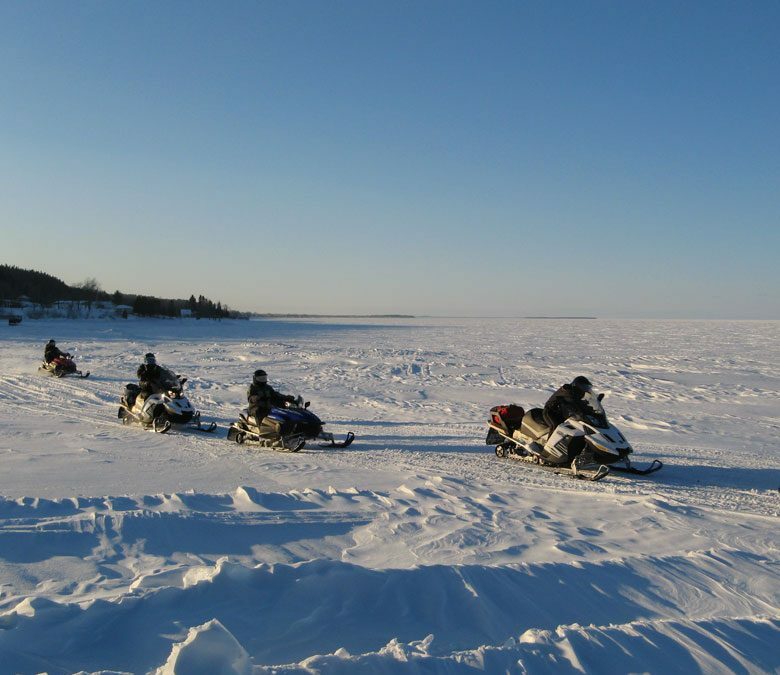 This raid is definitely sporty with more than 1200kms snowmobiling. Within this expedition you will cross, among other places, the aboriginal territory Manawan and the Mauricie park. You will also enjoy the hospitality of the recluded outfitters. You will follow pathways aways from civilazation and thus, feel like an adventurer. You will certainly have the chance to see numerous wild animals in their natural habitat. Your accommodations are chosen for their conviviality, authenticity and comfort, but especially for their tranquility. We privileged places far from the big tour operators to ensure you a total escape all along your trip. But the first goal of this raid is the pleasure of steering : you will experiment the exhilaration of sliding and of speed in sumptuous landscapes and that feeling to be on top of the world in the numerous off-road races. We will welcome you at the airport and drive you to your accommodation. On arrival, with welcome drinks in hands, we will introduce you to your week program. Then you can make yourself comfortable at your inn and enjoy a good meal. This morning you will begin your great adventure : you will leave for your five days raid. Once your bag is clipped on…let’s go! You will achieve a 200 kilometers stage to join the Mastigouche outfitter in the early evening. You will have dinner and sleep there. After a great breakfast, you will leave for a new snowmobile day. You will achieve one of the biggest stages of your raid by crossing fantastic winter-covered lakes and forests. At the end of the day, you will arrive to Beaulieu inn to have dinner and sleep. This stage represents about 260 kms. This morning you will need to recharge your batteries ! Most of the day is to be cleared in the morning. We will cross Mauricie park to arrive to Lac du Repos outfitter where we will have lunch. This isolated snowmobile relay in the middle of the forest will leave you speechless. Then we will leave towards north on the huge Manawan lake to reach another isolated outfitter : Kanawata. You will have dinner and sleep there. This stage covers around 250kms. A new adventure day will begin ! This morning we will reach Manawan village, an authentic little aboriginal village where lives the Atikamekw tribe. We will have lunch there and thenl travel to St Michel des Saints and cross the Taureau lake. Dinner and overnight at the Pignon Rouge outfitter, located on Lake Mica shores. This stage covers around 200kms. In the early morning, you will ride off-road until a viewpoint on the lake and overview of the region. We will start the return journey, which will drive us to Saint Côme. In winter, this charming little village of Lanaudière region hosts an ice sculpture competition. If you your reservation has been made during this competition time, you will enjoy seeing the artists at work. At the end of the day you will be back at our center and we will drive you to Montreal. Free dinner and night in a downtown hotel. Take this last day to visit this beautiful city, from old Montreal to the Mont Royal plateau, and underground shopping mall. Don’t forget to buy maple syrup ! In the afternoon, you will go to the airport to board your return flight. It is a lovely inn composed of bedrooms with double or twin bed and private or to shared bathroom. You will relax in front of a fireplace in the living room. Option Bombardier 900 ACE (90 horsepower) : +180€ (per person). These prices are for double occupancy, you can choose to have an individual bedroom for a supplement of price. Please contact us for further information.